Eat Your City: Ultimate Slow cooker or Crock pot BBQ Ribs recipe.. super insanely easy! 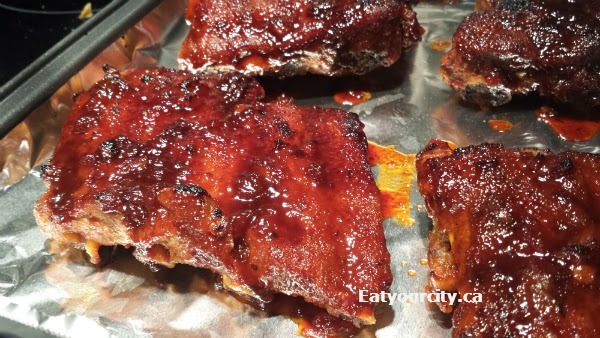 3) Finish off ribs under the broiler to imitate an upside down BBQ in your house... with total hands on prep time = 20-30min tops (including broiling time). Heck, this recipe is so easy, you might just cheat on your trusty BBQ and make these super tender ribs only using the slowcooker/crockpot and oven from now on... or save this gem for the winter when you really don't feel like bundling up outside to BBQ and have a taste of BBQ happiness all year round! While you can use any bottled BBQ sauce you have on hand... this BBQ sauce is super easy to toss together with what most folks have kicking around as condiments if you happen to look into the cupboard and realize oops... nada. Its a spin on Ina Garten's (Barefoot Contessa's) BBQ sauce... I love her use of hoisin sauce since its molasses-y, has sweet elements and adds a rich dark caramel color to the BBQ sauce... genius! You can make up to 2 full racks of ribs in a large 7 quart crockpot (as I did)- just wrap the second rack around the other side, or if you're cutting up the ribs into portions, line all surfaces of the crockpot with ribs... or 1/2 the recipe for just one rack of ribs... don't worry if your crockpot looks too full, ribs do cook down. And don't be shy with the paprika.. its very mellow, isn't as spicy "hot" as pepper and gives the ribs a nice color as well as a kick of flavor. Step 2: Mix ingredients together for BBQ sauce, or use bottled BBQ sauce. Dump BBQ sauce to coat all the ribs - dont' be afraid to use your hands and massage it into the ribs! Step 3: Put the lid on and turn on the slow cooker or crock pot to either high for 3-4 hours or low for 6-8 hours. My slow cooker runs on the hot side, so my ribs were fork tender after 2.5 hours. Use the longer end of the range if you like fall off bone ribs, use the shorter time as an estimate if you like fork tender. Step 4: Preheat oven broiler to high. Transfer ribs to a foil lined baking sheet. Skim off fat from cooking juices and reduce the juices to half over high heat in a non-stick sauce pan - boil for about 10-15min. Ribs right out of the slow cooker before getting basted - so moist! Step 5: Baste the ribs: with reduced BBQ sauce. Pop in oven with the oven rack as close to the broiler without touching for about 5 minutes until the sauce forms a nice crust and develops a beautiful BBQ'ed look... the interior will remain nice and moist, promise! Now... Dig in! 1) If you're using this BBQ sauce for this recipe, just mix all the ingredients together in a medium bowl. 2) If you're using this sauce for other recipes, mix all ingredients together in a non-stick saucepan and simmer on low for about 30min. If you like your sauce smooth rather than chunky, after making the sauce -cool sauce, then use a hand blender to purée it smooth. 1) Rinse the ribs and pat dry with paper towels. Rub all over with rub spices and place thick side touching the slow cooker or crock pot sides. 2) Mix ingredients together for BBQ sauce, or use bottled BBQ sauce. 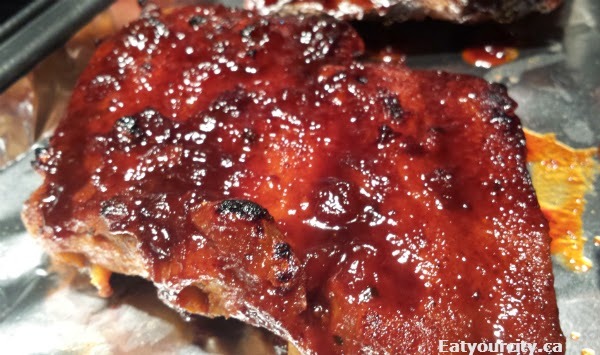 Dump BBQ sauce to coat all the ribs. 3) Put the lid on and turn on the slow cooker or crock pot to either high for 3-4 hours or low for 6-8 hours. My slow cooker runs on the hot side, so my ribs were fork tender after 2.5 hours. Use the longer end of the range if you like fall off bone ribs, use the shorter time as an estimate if you like fork tender. 4) Preheat oven broiler to high. Transfer ribs to a foil lined baking sheet. Skim off fat from cooking juices and reduce the juices to half over high heat in a non-stick sauce pan - boil for about 10-15min. 5) Baste the ribs : with reduced BBQ sauce. Pop in oven with the oven rack as close to the broiler without touching for about 5 minutes until the sauce forms a nice crust and develops a beautiful BBQ'ed look. Dig in!